ARIA Hall of Fame inductees the Hoodoo Gurus and Australian rock legends Baby Animals will perform at the 10th anniversary Supercars event in Townsville. Baby Animals lead singer Suze DeMarchi visited Townsville today to make the announcement alongside leading drivers Shane van Gisbergen, Scott McLaughlin and James Courtney. Playing on Friday night of the July 6-8 event, the concert will be followed by performances from Aussie rock legends John Farnham and Daryl Braithwaite on the Saturday night. The Hoodoo Gurus were inducted into the ARIA Hall of Fame in 2007 following 25 years of success at home and abroad. They’ve sold over 500,000 albums since their debut in 1981. The Baby Animals have been one of Australia’s most popular rock bands since forming in 1989. Their debut album was a multi-platinum No.1 smash, leading to three ARIA Awards and global tours with Van Halen, Bryan Adams and the Black Crowes. Supercars Chief Executive Sean Seamer says today’s major announcements add to what is already a huge line up of entertainment on and off track at this year’s Watpac Townsville 400. This year the Touring Car Masters joins the support racing bill for the first time, as well as new category the ECB SuperUtes Series, which was launched in Townsville last year. “We expect these two nights of all Aussie entertainment to pack the big top at Reid Park along with the strongest on-track line-ups in the events history including the much-loved Aussie grunt of the Touring Car Masters,” Seamer said. “These acts among the biggest names in Australian music history. To have them on stage at across two massive nights is great news for our fans who have helped to make the Townsville event a huge success in the past decade. Minister for Tourism Industry Development Kate Jones said the Townsville 400 is one of Queensland’s must see major events. “This year marks the 10th Anniversary of the Townsville 400 and what better way to celebrate than listening to some Aussie rock legends,” Jones said. “The stellar line up of entertainment and the Supercars action draw visitors from around Australia and world to Townsville. “Each year more than 100,000 Supercar fans visit Townsville for this event, generating millions of dollars for the Townsville and Queensland’s economy. 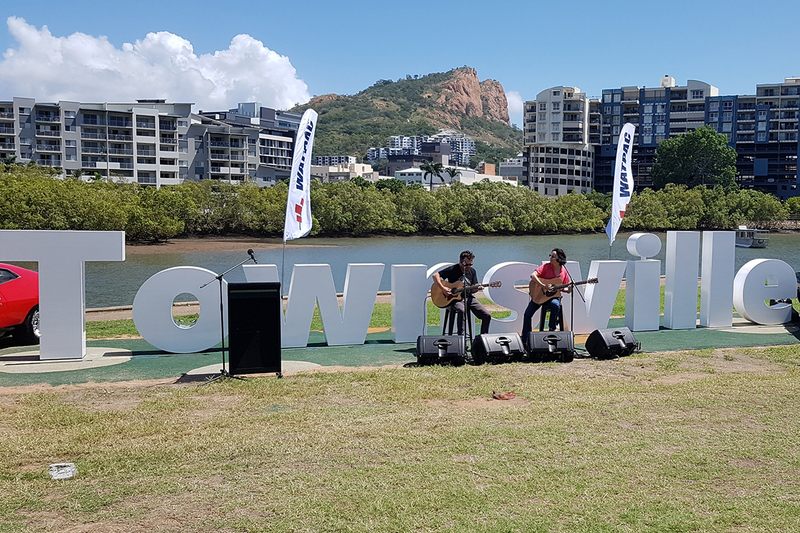 Townsville Mayor Jenny Hill is thrilled that this year’s event will feature a huge all Aussie entertainment line-up, including TCM, which features names such as John Bowe and Steven Johnson. “This year we are celebrating the history of Supercars in Townsville, and what better way to do that than to have some of the most historic names in Australian motorsport on track at Reid Park for the very first time,” Cr Hill said. “To have three days of great on-track racing matched by two nights of entertainment by some of the biggest names in Australian rock will really make this year’s Supercars event in Townsville one to remember. The Dunlop Super2 Series and Toyota 86 Racing Series complete the support race line-up. Tickets for the event can be purchased through Ticketek.